It would be hard to imagine a more multifaceted musician in this country than David Stanhope. Conductor of opera, ballet, film music and symphonies; brass player, pianist and orchestrator extraordinaire, the man has long been fond of dabbling with technology. 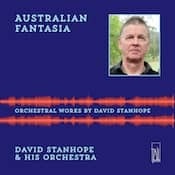 Like many of his generatlon, his music isn't played much in our concert halls any more, so Stanhope has taken to computer instruments to create a "virtual orchestra" to breathe new life into his music, and that of other neglected Australian composers. The results are astonishingly good; it is almost impossible to discern any difference between the real orchestra and its computerised counterpart - except, perhaps, when there is something of a metallic sheen to the overall sound. Still, if his computer can produce to convincing effect a string orchestra, a pipe organ and a triangle ping, who are we to decry the end result? My own reservation is the sheer volume of this album’s 17 tracks, totalling nearly 77 minutes. While the composer may prefer to ramp up the volume level, a listener may reach to turn it down. There is a ceremonial demeanour to much of this full-blooded fare, such as music for the Sydney Olympics fireworks and an arrangement of the national anthem. Overall, the music is splendid, especially sections where brass sections dominate. The ghosts of Percy Grainger and, increasingly, Charles Ives hover heavily over Stanhope's scores, and his lush and highly chromatic arrangements of Grainger. Rachmaninov. Faure and Godowsky make for compelling listening. Overall, though, it compels a question: who needs an orchestra anymore?